Canadian supplier Magna International Inc., in cooperation with Ford Motor Co., says it has developed a prototype carbon fibre composite subframe that reduces mass by 34 per cent from a stamped steel equivalent. The subframe would reduce vehicle weight, increasing fuel efficiency. 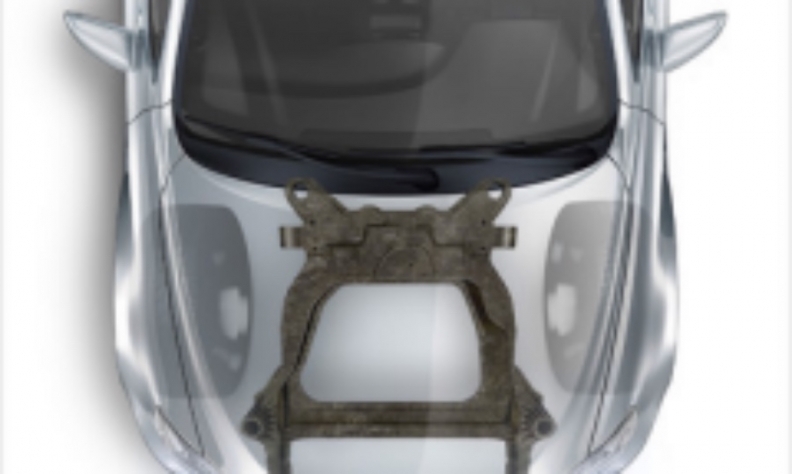 By replacing 45 steel parts with two molded and four metallic parts, the prototype subframe achieves an 87 per cent reduction in the number of parts used. The moldings are joined by adhesive and rivets. The subframe is a key part of a vehicle’s structure, typically providing a place to attach the engine and wheels while contributing rigidity and crash management. “We are able to take a clean-sheet approach with design, materials and processing, collaborate with the customer and within our product groups, and deliver a solution with the potential to really move the needle in terms of aggressive lightweighting without sacrificing styling or performance,” Grahame Burrow, president of Magna Exteriors, said at an industry conference in Paris. Magna said the design has passed all performance requirements based on computer-aided engineering analyses. Magna is producing prototype subframes for component and vehicle-level testing at Ford. Testing will evaluate corrosion, stone chipping and bolt load retention, which aren’t measured by computer-aided engineering. The project team will also develop a recommended design, manufacturing and assembly process. “We must continue to work hard to achieve these lightweight solutions at the most affordable costs. Magna and Ford working together on this carbon fibre composite subframe is a great example of collaboration on advanced materials,” Mike Whitens, director of vehicle enterprise systems within Ford research and advanced engineering, said in a statement. Automakers have been under pressure to meet higher U.S. fuel economy targets of more than 50 mpg by the 2025 model year, but President Donald Trump on Wednesday is expected to reopen a midterm review of the EPA’s fuel economy standards.